When it comes to shopping, I definitely balance out the times I shop in person vs. online. I love the ease of shopping online (less of a hassle to check-out, no people, promotion codes, free shipping and cleanliness of items) but the experience of shopping in person can't be beat (store promotions, trying on things, feeling the texture/fabric/quality of items and instant gratification of having the items). I also have to say that the deals are sometimes better in the store! In this instance, I nabbed my t-shirt and beanie for only $5 each. Polka dots and stripes on discount? Sold! How about you? Which method of shopping do you prefer? eeeek, I still want that jacket! I work from home and online, so I've been shopping online. It's just too easy lol. I do like to take a day every once in a while and go check out the stores. I tend to go during the week day so I'm not overwhelmed by the crowds. The places to shop in SJ aren't as great as sf...so I've been leaning on online retailers a lot lately. Such a cute outfit! 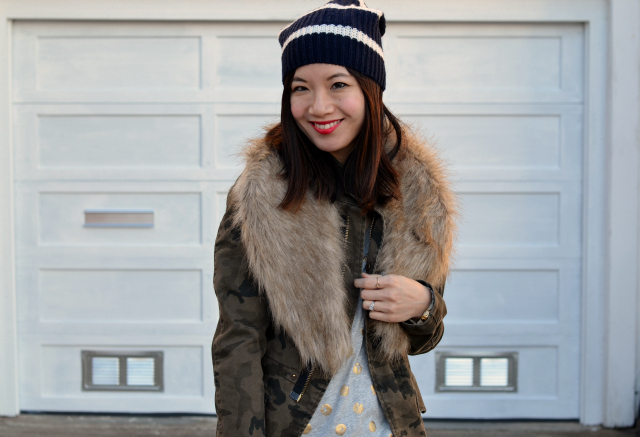 I love the faux fur collar with the camo jacket...it's such a stylish look! I'm usually an online shopper because it's easier, but every so often it's definitely nice to check out some of the boutique stores that don't have online shopping. I absolutely looove the polka dot top, perfect with the camo jacket and fur stole. This is such a great look! I love seeing you style that fur stole! And I was just thinking about something like this, this morning.. On why I've been shopping online more lately instead of actually going out to the stores (which has it's perks as well) but I think I like the convenience and ease of online shopping more, and the only real downside is when an item isn't like what you have imagined and you have to go return it haha. Love this look! Especially the jacket! I think I prefer online shopping. It's just easier, but I hate the waiting part of online shopping! I want my items right away! I love anything polka dot! You can definitely dress this top up or down! Fur! Camo! My absolute Winter favorites of this season! You look fantastic. I love the ability to search for specific items and compare prices while online shopping...but you can't beat the tangibleness of touching fabric and trying on clothes in person. I used to never shop online however now I've bought 8 times with varying results. I find that dresses are easier to buy than say shoes. I like you in this style of hat. loving that top (obviously). I like both - but for shopping online I try and do the fast pace fashion stores (like F21) because I can NEVER stand how crowded and messy the stores get! Other stores I love going in person - like you said, it can't be beat! gold polka dots and fur, amaze. That t shirt and that jacket were made for each other...such a cute and casual look, and I love how you threw on some black pumps with it! I love that polka dot tee! I personally love to shop in person the most. I only shop online if it's a store that I definitely know the fit and have free returns. what a fantastic look! 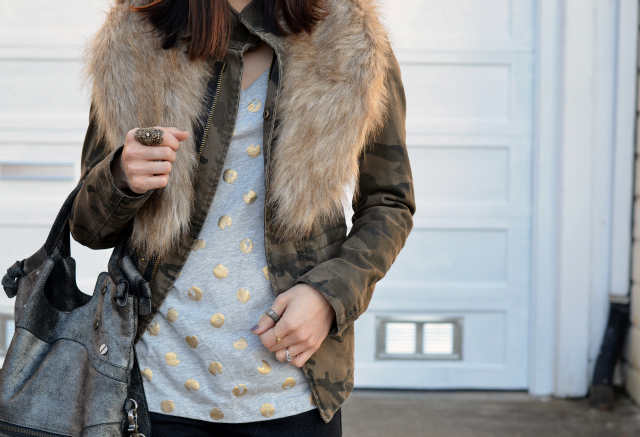 love the fur over the camo coat! and the gold polka dots are so adorable! Your dotted shirt is cute. I'm loving the gold polka dots in this outfit and Zara always has the best heels! I usually prefer to shop in person but I'll shop online if there are incredible deals (or if they don't have a brick and mortar store, like ASOS). 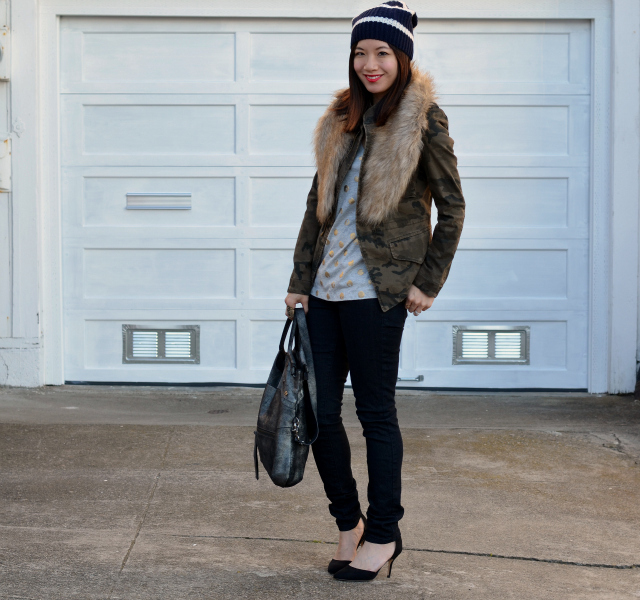 I've been dying for a fur collar and can't fine an inexpensive one anywhere! Love it paired with the camo jacket! Ah that's a tough one. I like both types of shopping for the exact same reasons you listed. I think I prefer shopping in person better though, just because it means I know for sure the item fits perfectly and I get to leave the store with it that instant haha. Love the new beanie, what a score! I used to only shop in store, mainly because I'm impatient and usually want to wear it right away lol But I have been doing some online shopping and it is less of a hassle. 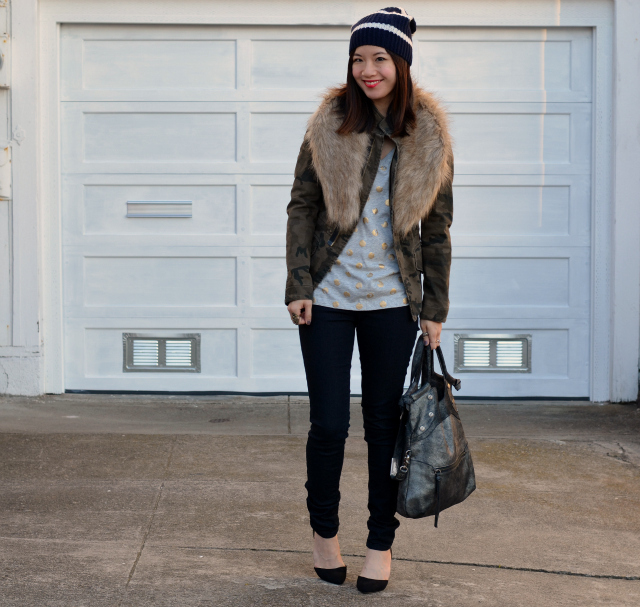 I LOVE the mix of prints and texture you have in this outfit!! A fur scarf is at the top of my to find list! Love yours. I'm definitely more likely to buy something in an actual store than online. I tend to think more about what I'm buying before I click the sales button. That's an awesome coat and fur scarf. I love sale finds. I love your metallic dots! I personally prefer to shop online - I love to overthink my purchases and doing it online from home definitely works with that! cute outfit! i also prefer to shop in person. i just like to try things on and see them on me before i buy them. you found some great deals! i'm a new follower! i'm definitely an online girl! i know my size, free shipping and great discounts. i do agree with you about finding amazing discounts in stores. you won't find those $5 finds online. hahaha love your jacket nancy. Casual chic! 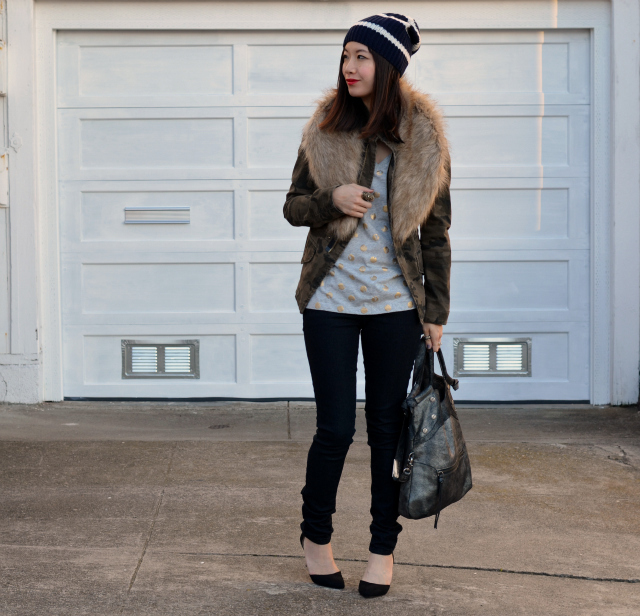 Love your cozy fur collar! I have that shirt too :) i love it with the camo jacket! That is the cutest top and what a great deal you got on it! Chic and edgy with a touch of glam from your polka dot top! Really great look Nancy:)! I'm the same - i like both..depends on my mood. I tend to have more self control online. Love that shirt! Great deal! I love everything about this look. I have the same faux fur collar, I might have to bring it out again. Love your polka dot top, so pretty! The fur with camo is so cute and how can you not love gold polka dots. You look great!